If you ever encounter anyone wearing this armor, you can probably rest assured that they mean business. 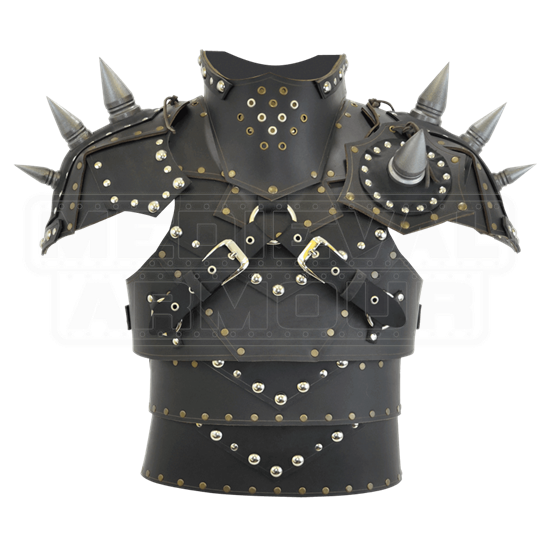 The Dark Lords Breastplate with Pauldrons is an intimidating piece of armor that features all the spikes a warrior would ever want or need. This armor is truly an impressive thing, possessing all the features one would expect of great armor. The armor is constructed from high quality 9-10 oz. leather that makes it perfect for use as LARP armor, although it also excels in other areas, as well. The armor consists of layered leather plates on the breastplate and backplate, featuring a stunning array of silver and bronze rivets that hold the armor together and reinforce its strength. The center of the breastplate features a pair of leather belts, secured directly to the center of the chest as decoration. Included with the breastplate and backplate is a leather neck guard that features silver and bronze grommets, which make airflow and breathing easier. The back of the neck guard also features grommets, which allow it to be tied and secured to the back of the armor. Included with the Dark Lords Breastplate with Pauldrons are a set of asymmetrical pauldrons, which take the armor and give it a much more intimidating profile. Both pauldrons are over the shoulder and feature a matching shape and form, possessing matching construction from layered leather plating fastened together with silver and bronze rivets. Both also feature a trio of intimidating spikes that run down their sides. One pauldron, however, features a secondary tie-in, called a besagew, which consists of a leather plate on which a large decorative spike has been affixed, which when worn, covers the arm-hole and provides a bit more protection. It is secured to the torso via buckled leather straps, which ensures that within each size, there is a range of adjustability. With that in mind, make sure you order your armor as close to your natural size as possible, and then adjust to comfort when you wear your armor. The pauldrons are tied to the shoulders of the armor via grommets and leather laces. 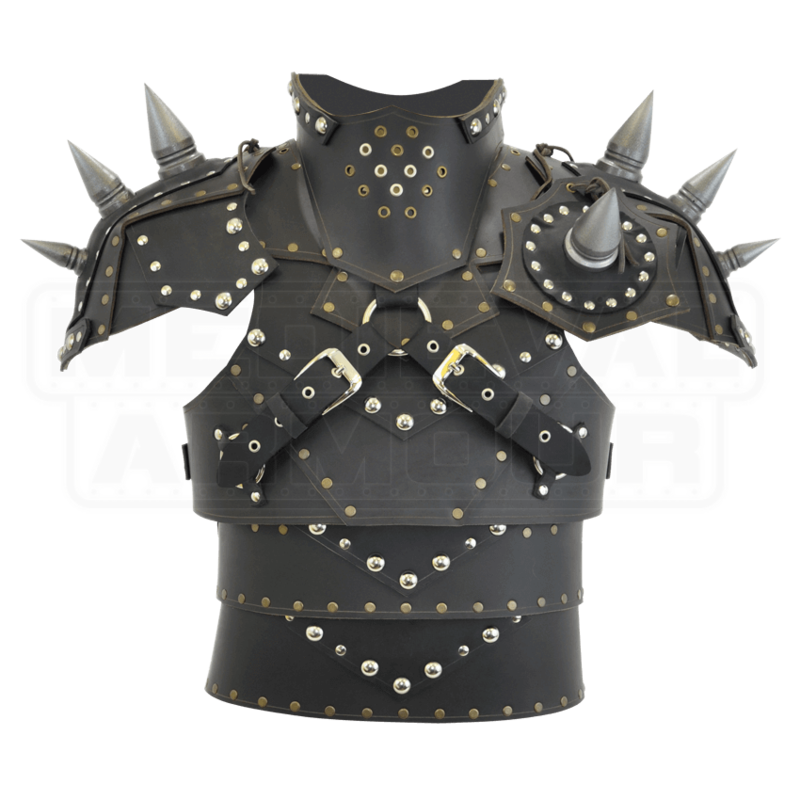 The spikes that adorn this armor are crafted from high quality foam similar to what is used in LARP weapons, which gives the spikes a realistic look while making them safe for touch and potential impact. There is no denying how fearsome you will look when you march onto the field fully decked out in this Dark Lords Breastplate with Pauldrons.